Your first stop is the medieval Gothic abbey of Doberan with its rare preserved interior. Step back in time and marvel at the architectural, scientific and artist mastership of the monks. Your guide points out the most fascinating altars, burial places and sculptures to you and gives insight into the life in the monastery. The town of Bad Doberan itself was a popular summer residence for the family of the Duke of Mecklenburg. The central square is lined with the historic villas and parlors. Right through it all, the Molli train steams its way towards the coast. Embark on a scenic and nostalgic train ride to Heiligendamm - the oldest seaside resort on the German Baltic coast, founded 1793. After a brief visit to this famous Grand Hotel Heiligendamm, continue to nearby Kuehlungsborn. 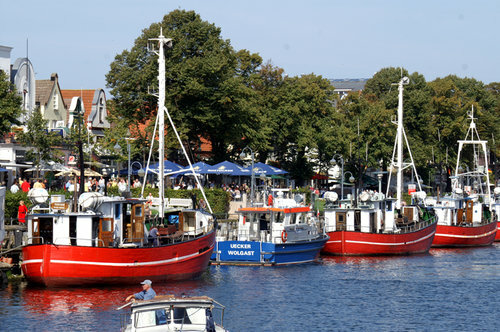 Kuehlungsborn is a lively and large resort with a long promenade and many shops, cafés and hotels. Enjoy a ride or walk along the old villas in the typical “spa style” from the 19th and early 20th century and lean back and enjoy a snack and drink in a local place with a view to the sea or the promenade. After this leisurely stop, the tour returns to the port via the scenic coastal landscape.